It is easy to overlook the importance of cabinet handles when you are remodeling. Whether you are getting a complete makeover or just a partial remodel, one of the more underrated components of your bathroom & kitchen decorating believe it or not is the hardware. 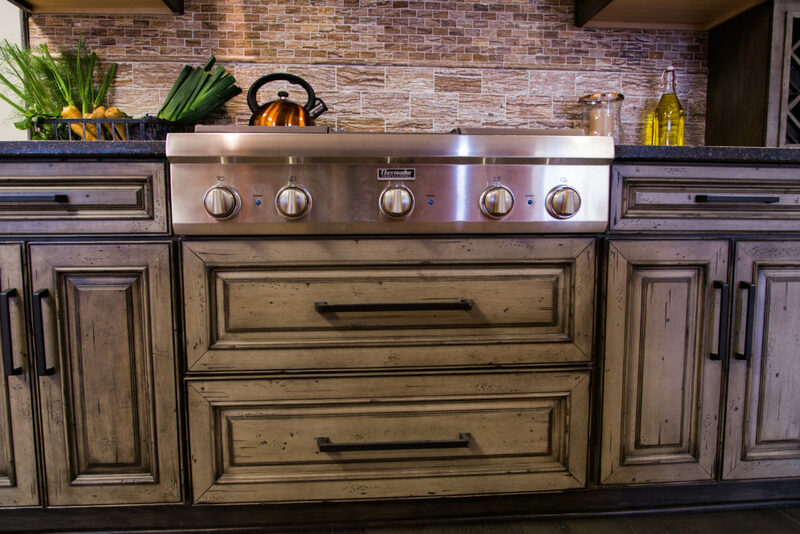 Cabinet handles, knobs and pulls can make a big difference in the final look of your kitchen & bath. You will quickly realize that you use your kitchen & bathroom hardware dozens of times a day. This makes the form and function of the hardware the most important element when choosing your hardware. When selecting your hardware there is a lot to consider so ask yourself these questions: Which type of hardware? Should you use a knob, a pull, or a handle? What size and positioning of the handles should you use? Which style of hardware would look best in my kitchen? Which kind of material should you use? And finally what finish should you use? All these questions can seem a little overwhelming but don’t worry! Here we will go over all you need to know to select the correct cabinetry hardware for your kitchen & bath. For instance pricing. All hardware prixcing is set by the manufacturer, not the store, so no need to shop store to store for better pricing. Most stores keep their prices right at the minimum advertised price in order to create an even playing field and stop stores from undercutting one another. Now let’s consider the types of hardware would work best.Knobs have only one screw, while pulls have two screws, one at each end of the pull. Knobs are great for smaller drawers with light weight and even larger cabinet doors. Consider aesthetics, function, proportion, and balance when deciding on the size of a pull or knob. Pulls are usually used when trying to create a more modern and sophisticated look. With their clean and streamlined looks, handles and pulls should not be overlooked when coming up with your decorating concept & design. Handles and pulls are used for larger drawers to help stabilize and distribute weight properly. A larger drawer or door could use a much larger pull or knob or even two if larger than 18 inches. Typically, pulls are positioned horizontal on drawers and vertically on doors. Keep in mind that these selections you are making must also be comfortable for daily use. Be sure to handle the hardware before making a final decision to get the right size and shape for your hands. You can even order some samples to make sure you have made the right decision. Let’s move on to the style of hardware. While choosing your hardware please be sure to remember that the style of your kitchen will need to match the hardware accordingly. Are you going for the sleek modern look or a rustic charm? An y style you choose for your kitchen or bathroom should reflect in the hardware and doesn’t have to be overstated.If the style of the kitchen is already understate, then you can do the complete opposite and select a bold hardware. Select a bold hardware that speaks to you as soon as you lay your eyes on it. So whether you go with traditional, contemporary, transitional or even eclectic, the choice is yours so make it wisely. A good rule of thumb for transitional and traditional pulls is they should be about one-third of the length of the drawer or cabinet drawer. Kitchen cabinet hardware may not seem high profile but it can add or detract from the overall look of your kitchen. When making selections you should also consider the light fixtures and your kitchen and other door knobs that already exist in the home. Also consider other door knobs that already exists in your home. If you plan to replace those you should try to cordinate them when selecting. Think of your hardware as the jewelry of your home. Some people even add a little bling. Be sure to not over accessorize. When it comes to the bathroom cabinet hardware, bathroom door knobs, and your vanity, it should all be cohesive. You also need to consider the material of the hardware and the finish you want to use in your kitchen or bath. To compose your cabinet hardware there is a variety of materials used, mostly metal alloys. Brass & bronze are antimicrobial and help reduce the spread of germs. Stainless steel, pewter nickel, glass and crystal are some of the most popular material choices. All of these materials of hardware and even more are made in all styles for you to choose from. Remember to not get overwhelmed with all your choices, I would suggest zeroing in on your style first then your materials and sizes. You can shop by size. Size breaks down the selection according to drill center, which is the distance between the holes. Remember that the same finish from different manufactures rarely matches perfectly. You should try to use just one manufacturer when making your hardware selections. This would also be a great time to order those samples to ensure that the hardware does match if you absolutely have to use more than one manufacturer. There are a wide variety of cabinet hardware finishes to choose from. Matte, oil rubbed, satin, antique, tarnished, polished or brushed are some of the most popular. Just be sure that the finish of your cabinet hardware compliments the overall decor of your kitchen, bathroom, or home. When ordering your cabinet hardware remember that almost all hardware these days are either mass produced overseas or custom made in the U.S. Mass produced hardware is readily available to ship and is less expensive. Domestically produced hardware tends to take much longer to obtain. Most of it is custom made and can get quite expensive. They are made with higher quality materials and come in a wider variety of finishes. Make sure to inquire about how long it will take to receive your hardware selections for some vendors can take up to 12 weeks for delivery. I hope these tips make your hardware selection process much easier and not quite so overwhelming. Be sure to look out for our next blog regarding bathroom remodeling.